There is probably no happier show in any artist’s career than a celebratory exit show. 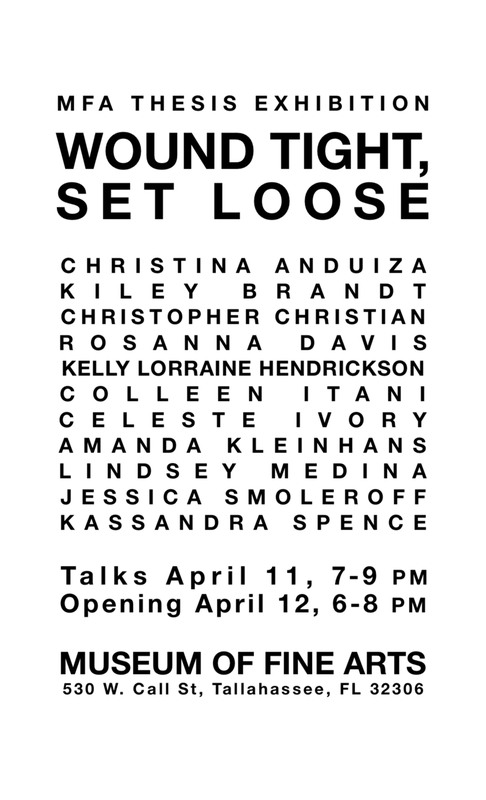 Eleven graduating artist in Florida State Universities MFA studio art program will be presenting their work in a thesis exhibition entitled, “Wound Tight, Set Loose” at the Florida State University Museum of Fine Arts. There will be talks given by the MFA students on April 11th from 7-9pm. The opening for the exhibition is on April 12th from 6-8 pm, and will be on display during open museum hours until May 2nd. Snacks and refreshments will be provided during the opening. We hope to see you there.